Snoring in small children may be linked to behavioral problems such as hyperactivity, researchers say. Everyone snores, even children. But if your little ones snore often and loudly, doctors say they may face other problems, such as hyperactivity, inattention and depression. Researchers at the Cincinnati Children’s Hospital Medical Center studied 249 children, surveying their mothers about their youngsters’ sleeping habits. The study found children who snored loudly at least twice a week at the ages of 2 and 3 had more behavioral problems than children who didn’t snore, or who snored at 2 or 3 but not at both ages. "The strongest predictors of persistent snoring were lower socioeconomic status and the absence or shorter duration of breast-feeding," says Dr. Dean Beebe, director of the hospital's neuropsychology program. 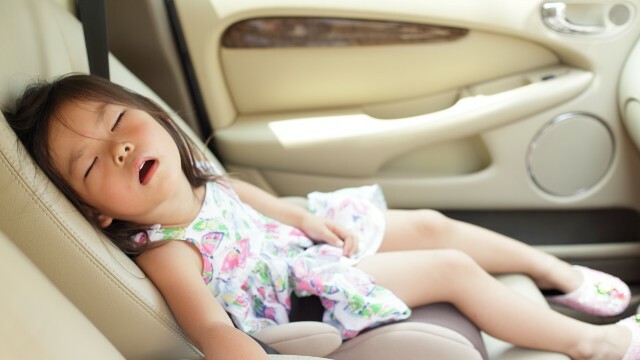 "This would suggest that doctors routinely screen for and track snoring, especially in children from poorer families, and refer loudly-snoring children for follow-up care. "Failing to screen, or taking a 'wait and see' approach on snoring, could make preschool behavior problems worse," he says. "The findings also support the encouragement and facilitation of infant breast-feeding." Investigators say this is the first study to look at the relationship between continual snoring and behavior problems in preschool children. According to doctors, loud, persistent snoring occurs in approximately one of every 10 children. "A lot of kids snore every so often, and cartoons make snoring look cute or funny. But loud snoring that lasts for months is not normal, and anything that puts young kids at that much risk for behavioral problems is neither cute nor funny," says Beebe. "That kind of snoring can be a sign of real breathing problems at night that are treatable." Researchers did not examine the reasons why children snore, Beebe says, but studies on animal models show continual snoring may affect behavior in two ways - through poor sleep quality or bad air exchange. If the part of the brain that controls moods is not properly rested and does not get proper exchange of oxygen, the brain is altered, which can cause irritability, he says. The mood and behavior of young children likely are affected in similar ways. Study authors noted that breast-feeding, especially over longer periods of time, seemed to protect toddlers against persistent snoring, even after taking into account other factors in the child’s life. The study is published in this week's edition of "Pediatrics." Next entry »What is bipolar II disorder? Anybody notice the seatbelt is worn incorrectly in the stock photo? A child should never be allowed to place the shoulder strap behind his or her back! The seatbelt is just the beginning. That kid should be in a car seat. These parents need to get over it. Try having an autistic child, knowing that everything great you had planned for your child and family are destroyed. Help an autistic family! It cost a family about $72,000 per year to pay for treatments that actually make a difference! @cure autism. I am confused as to what ' These parents need to get over it' has anything to do with the study on snoring and mood disorders in preschoolers. My stepdaughters are are autistic but recently deemed 'recovered' and I can tell you now that putting down other parents in times of their own different situation is not a way to get The word out on autisim. It is about supporting our children by supporting each other and providing Information for those uninformed. NOT putting others down. Sleep apnea is not exclusive to obese people. But it does go undiagnosed in children, and can be the root of behavioral problems. There is a genetic proclivity to sleep apnea and the problems stemming from it, if untreated, could be a factor in why these snoring children are often found in low socioeconomic families. Certainly hope this study was peer reviewed, because it contains more "may cause's" than a political ad. Sounds like a research project by a bunch of bored underemployed PHD's with an pretty lax government grant. Maybe adjusting a child' sleeping position could eliminate this "snoring" problem. The youngster in the photo certainly doesn't look too comfortable at all. Oh well! My boy snored like a drunk sailor til he was 3, then we had his huge tonsils and adenoids removed and he is a quiet, still, happy little sleeper, successful in preschool and ready to conquer kindergarten. Our middle son, which is 4 now, was breastfed until he was 15 months old. He never ONCE took a bottle, he refused it. Once he was 7 months old he was eating some baby food, but still breastfed. When he sleeps, it sounds like our neighbors are working on their chainsaw. He saws logs. So the statement that breastfeeding longer seems to protect kids from persistent snoring does not hold water. In fact, he has been the sickest of our 3 boys by far. We have a 7yr old, and the one I am referring to is almost 5, the other one is 3. The older and younger boys have been hospitalized once each. Our middle son (the breastfeeder) has been hospitalized 11 times. Also, our other 2 both nursed less than 3 months, and they were on formula at 4 months old by their choice, not ours. My wife tried for several months to get them to nurse, but it was not successful. I am an advocate for breastfeeding, but I am on the fence with the claims that breastfed babies are healthier and have less health problems. With ours, it is the complete opposite. Children with severe snoring probably have obstructive sleep apnea, which is associated with interrupted or poor night sleep, with consequent daytime tiredness and poor attention. and venues. If it's someone she's worked with often, they may offer you a lower price. 2. Always make the final decision on your vendor, cake, dress, etc., yourself. That way you can keep track of your expenses and your budget. 3. Keep a running total of your expenses. Organize them by deposits paid, payments made and when additional and final payments are due. By doing this, there won't be any unpleasant surprises. 4. Do you have any family mem. My 8 year old Grandson snores loudly, every night and every time he sleeps. He also grits his teeth badly. He is all over the bed at night, sometimes turning a complete circle by morning. He does the gaspy thing, almost waking himself up severel times. I've told his parents that his snoring is not normal, but they think I am paranoid and have never taken it seriously. His behavior this week has been horrific. He is irritable, snappy, backtalking, downright mean. He doesn't want to go to bed at night. Sometimes can't sleep all night long. He has a problem with sugar and carbs. They make him horribly hyper and he will do things he knows he shouldn't do. He can go from a sweet, quiet, loving little boy, sitting with you working on a project to a wild, raving, jumping, running, kicking, hitting, very loud little goblin. What can I tell his parents to convince them he needs to be seen by a doctor? I was looking at for some time for any top quality articles or blog posts in this particular style of location . Exploring in Google I ultimately located this blog. Reading this info therefore I am pleased expressing that I come with an extremely just right uncanny feeling I found out just what exactly I wanted. I most undoubtedly will guarantee to never omit this website and offers it a peek constantly. Thanks for sharing brilliant informations. Your website is so awesome. I am astounded by the important points that you have on this website. It unveils how nicely you perceive this subject. I Saved this internet site and will come back for further articles. I found this is the info I previously looked for everywhere and just could not come across. What a good site. I am going through some of these same issues as well. There is something about this website that is rather addictive and I would like to discover just what it could be. Do you really believe this new trend will continue for years to come? Just what I'm trying to find.